Can you tune a ukulele with a guitar tuner? There are a variety of guitar tuners on the market. 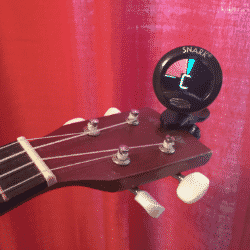 Clip-on tuners are the most versatile tuners used for guitars that can also be used to tune a ukulele. This multi-instrument tuner is very useful for getting your ukulele tuning just right every time. The issue with tuning the ukulele with the guitar tuner is just that there are several types of them. With some types you can easily do so while with others you cannot. Let’s compare tuners so you can see whether you can use the one you have and if not, you can consider getting a brand new one you can actually use with the ukulele. Pedal tuners are plugged in to the guitar. No microphones are necessary. These and all other types of tuners that require plugging in are not suitable for acoustic instruments such as the ukulele or the classical guitar for the obvious reason that the instruments have nowhere to plug in. This is unless you’re using an electric ukulele of course. If you have an electric or electric/acoustic ukulele you should be able to use a pedal tuner without a problem. These tuners are not suitable to tune the ukulele either because they are designed specifically for the guitar. What they do is they try to recognize which guitar string you are playing and then tell you whether it is high or low. These tuners are designed specifically to identify the notes of the guitar’s open strings. I do not recommend these tuners to anyone and especially not to beginners. These tuners, on the other hand, are capable of listening to all notes. They are designed to listen to whichever note you play and indicate which note you are closest to. By doing so it tells you whether your string is flat or sharp as compared to the desired pitch. The best types of chromatic tuners for the ukulele are the ones that clip on to the head of your instrument. These are designed to attach to the ukulele like a clothes peg and feel the vibration of the note you are playing. Since these tuners work by assessing the sound vibrations, they don’t discern between instruments. And so you could use such a tuner for any type of guitar (classical, steel, bass, electric), ukulele, violin and so on. This is the kind of tuner you should invest in. Here are some recommendations. You can see they are not that expensive and one will stay with you for many years. I’ve used one with my classical guitar for over a decade and I just changed the batteries a couple of times. Every sound you will ever make with a stringed instrument depends on the tuning of its open strings. The ukulele is no exception: every sound follows from the sound of the open strings so it is imperative that you get the tuning just right! First of all, it is absolutely critical to understand the set up of your open strings. Take your time to read this section carefully as it is crucial to your understanding of your instrument! Sit down with the ukulele and strum the open strings. Now, the string closest to your face (or your chin) is tuned to the note G. The one below it is a C, the one below that is an E and the thinnest one is tuned to the note A. That should be easy enough. Now with this standard tuning, all four strings are within the same octave. In SPN (short for scientific pitch notation – a system that numbers all the possible octaves in music from 0 to 10), the octave in which the ukulele is tuned to is specifically known as the fourth octave. What is important to keep in mind is that, in SPN, a new octave begins on every new C note and so the note C4 is the lowest note in its octave. Read that again because it is crucial: the note C4 is the lowest note in its octave! It is important because it means that the ukulele’s lowest note is the C (what is known as the third string) and not the G (the one closest to your chin and known as the fourth string). This is a feature unique to the ukulele. In every other string instrument such as bass, guitar, violin and harp, the strings get progressively thinner and higher in pitch. Here are the open strings of the ukulele in standard notation. Even if you do not read music, observe how it is the note C that is the lowest note but the second in line. The note G is actually the second highest. As a beginner you might find this to be counterintuitive (and to some extent it is) but you will get used to it in no time at all. I wanted to go through that with you because it is an absolutely crucial aspect of knowing the ukulele. Now that you know how the strings are set up, it will be time to tune them. Remember that to raise the pitch of a string, you must tighten the string and to tighten it, you must turn its tuning peg to the left. To lower the pitch of a string, you must loosen that string and to loosen it, you must turn its tuning peg to the right. In reality, you can actually tune your ukulele with anything that produces a fixed pitch that you can compare to. In this sense, the keyboard also makes the perfect tuner (and there are many keyboard apps as well). It is not a problem if you are not familiar with the keyboard. To orient yourself around the keys, just find the note known as the middle C. It is more or less the note C that lies in the middle of the keyboard. In SPN, that is note C4. And as we’ve said the note C4 is the lowest sounding note of your ukulele (assuming standard tuning). The string tuned to G4 is the same sound as the fifth white key above C4; E4 is three white keys above C4 and A4 is six. Note that when counting distances between notes, the first note is always counted as number 1. Now that we tackled the issue of guitar tuners, let me just tell you that a simple way of tuning the ukulele is online or by app. There are many good ones out there and they are quite easy to use. These tuners work in one of two basic ways: it listens to you or you listen to it. Or you can use an online ukulele tuner like this one: https://www.fender.com/online-ukulele-tuner. In the first type, you play a note and the app listens through your microphone. It will then assess whether your string is pitched in tune. If not, it will indicate that it is either flat (meaning you need to tighten the string to raise the pitch) or it is sharp (meaning that you need to loosen the string to lower the pitch). In the second type, the app plays for you the note and you must use your ears to make your string match the given sound. It is not too difficult to do this even for the first time. Listen to the desired pitch and just as before loosen the string to lower it or tighten it to raise it. While these apps are helpful, the clip on chromatic tuners we mentioned are probably the best solution. They are portable and they don’t require access to the Internet or access to your microphone (and that comes in handy when you are in a noisy environment that interferes with it). That is really all you need to know about tuning. In summary, keep in mind that the tuning of the ukulele is G4 – C4 – E4 – A4 and remember that the lowest sounding string out of them is C4. • And Clip on – meaning that they attach to the head of the instrument like a clothes peg to detect the vibrations of the instrument. You can also tune with a keyboard as long as you orient yourself around the keys using the middle C, which is also known as C4 in Scientific Pitch Notation (SPN). And you can use the online apps as long you have access to a device, can rely on your microphone and on your own hearing.